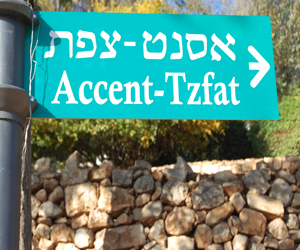 For over 25 years, whenever visitors to Tzfat would ask for a quiet and clean place to stay in the Old City, a place to learn about Judaism, a place where they could ask their questions and have someone answer them......they would be directed to the Ascent Experience. Located on the edge of the Old City, Ascent offers a warm and inviting place for Jews of all ages and backgrounds to come and explore their Judaism. Whether it be a drop-in guest who has come for an overnight visit, or several dozen visitors who have come together for a weekend seminar, Ascent insures that everyone is welcome. Ascent is first and foremost known for their Shabbat Experiences. Guests, some of whom are traveling through Israel on their own, and some who have arrived to participate in an Ascent seminar, find themselves welcomed, and given a schedule of Ascent activities. Classes are open to all, and cover a range of topics such as " How to DO Shabbat in the City of Kabbalah ,Prayer for Non-Synagogue Goers, Torah Tutorials, and Mystical Insights of the Torah Portion". Friday nights are experienced by visiting the various synagogues of Tzfat and being invited to a Shabbat meal for home hospitality. Shabbat day offers more classes, seminars, and wonderful Shabbat meals with local families. Visitors are welcome to spend time in the extensive Ascent Library, where a staff scholar is always available to answer all questions and help guests find books and other materials which can deepen their understanding of Judaism. Ascent places a lot of emphasis on Jewish Mysticism and Kabbalah, with their classes and materials available to insure that people with questions are able to explore Kabbalah in an authentic and non-commercial manner. During the week, Ascent serves as a drop-in center, even for people who are not staying over. Many local Tzfat residents come to the Ascent classes during the week as well, as they are so engaging and timely - daily classes cover topics such as "Soul Work, Tzfat Torah Personalities, Mystical Thought, Living with the Times and The Secrets of the Zohar". The number of people who have continued their Jewish exploration and learning after their visit to Ascent, BECAUSE of their visit to Ascent, is endless. "It was the first time that someone took the time to answer my questions" Sarah, a past visitor, said. "I always wanted to know more, but my questions were so basic, and I felt like they were so foolish. I didn't even know WHAT to ask! Now, I am confident that I know enough so that I know what to ask, who to ask, and how to search for answers. Ascent gave me that, and I will forever be grateful".